Bonus Fun Fact: This song was written by hitmaker Kenneth "Babyface" Edmonds and was nominated for a Grammy award. 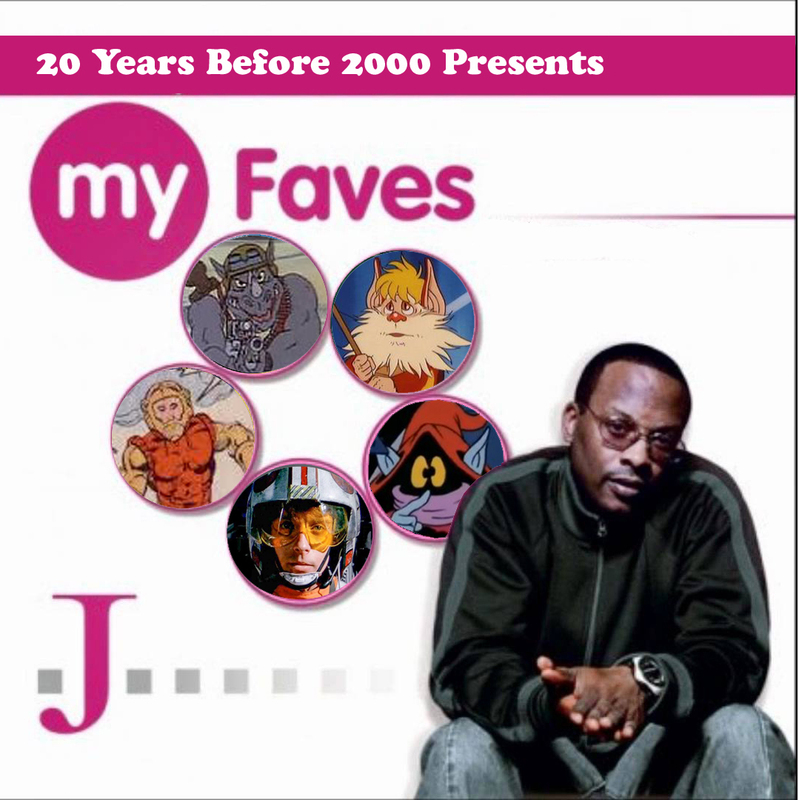 It won the Soul Train Music Award for Best R&B/Soul Single. These little guys were AWESOME! I loved the Air Raiders line of toys. I never owned any of the big battleships, but my neighbor did and I was envious. 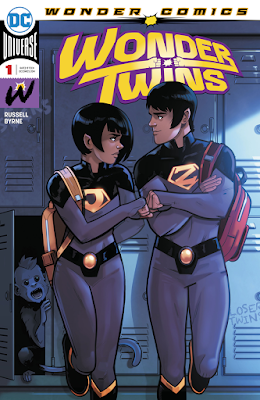 I loved the story of how the bad guys controlled the air and the rebels aka the Air Raiders were on a mission to make the air free to all who lived in Airlandia! The ships in the toy line featured some cool air related features from floating orbs to firing missiles. This little guy sadly is the only relic I own from this forgotten series. Ah, X-Wing Luke he looks nothing like the character and is probably the least wanted of all the Luke figures in the original Kenner line. In principle it should be a cool figure, but the likeness is way off. 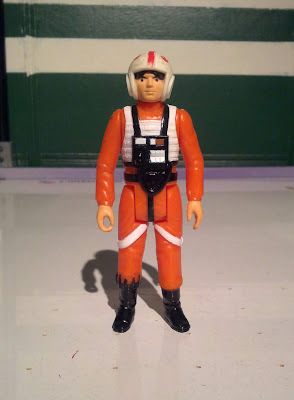 The positive side of this figure is that you could incorporate him into any battle as an anonymous pilot who just wants to rebel against the Empire! 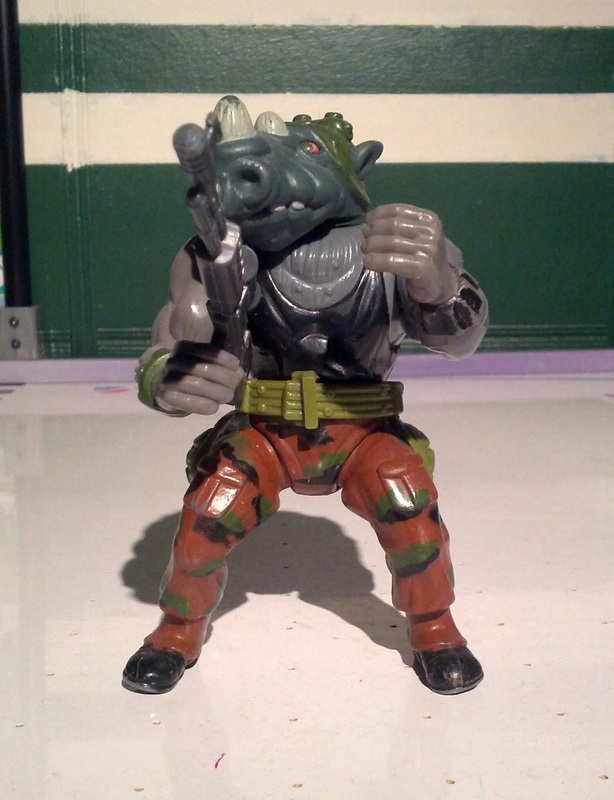 I always wanted this figure as a kid, but never got him until years later. He is so cool! He looks just like the character from the cartoon series. 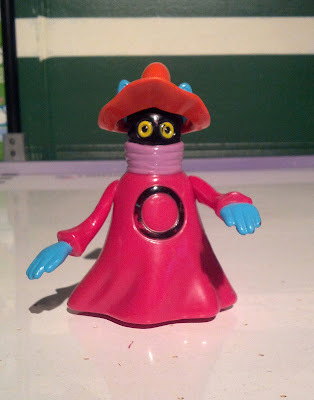 From his removable hat to pull cord spinning action this is one of my favorite Masters of the Universe figures of all time! The first ever Ninja Turtles action figure I ever owned was the original Donatello. 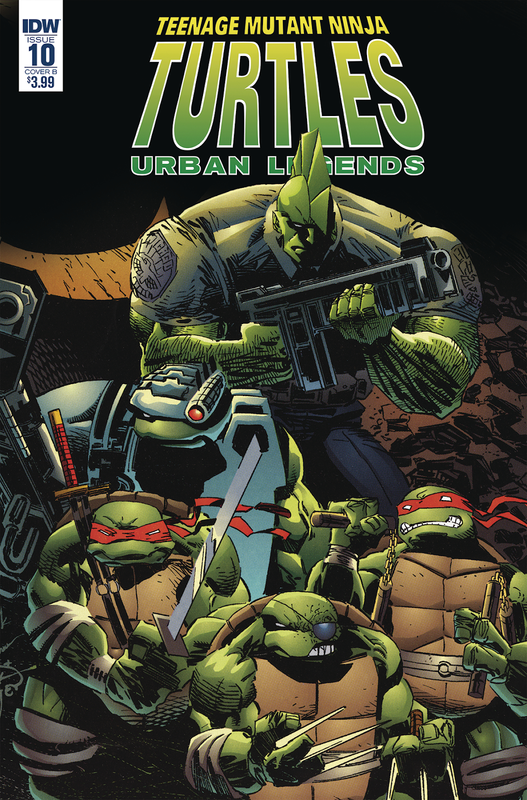 Some time later my Mom took us shopping at Ames Department Store and the entire line of TMNT toys was on sale and for some reason she spoiled me and my brother by buying us the entire first wave of figures! On that trip I ended up getting Leonardo, Foot Soldier and Rocksteady. He was so cool and the toy pictured above is the same toy my Mom got us over 30 years ago. This figure kinda ticked me off as a kid. 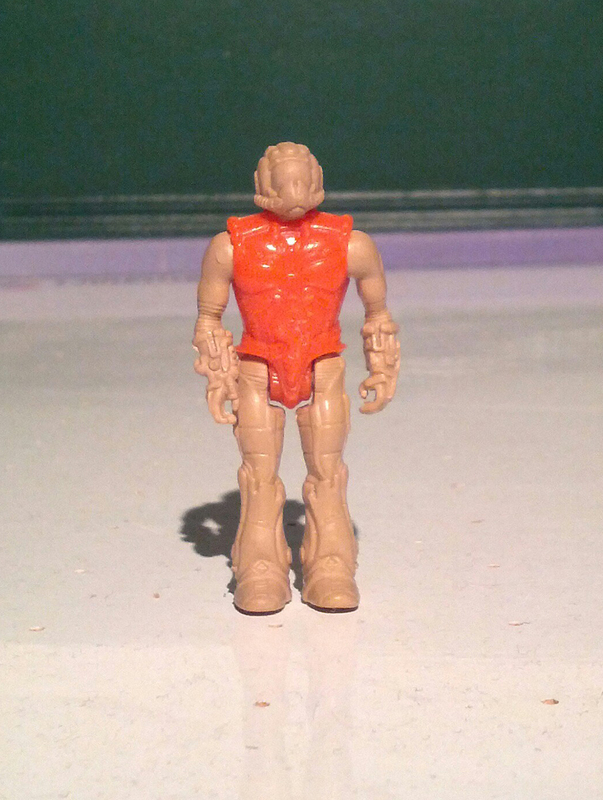 He was included when you bought the original Lion-O action figure. 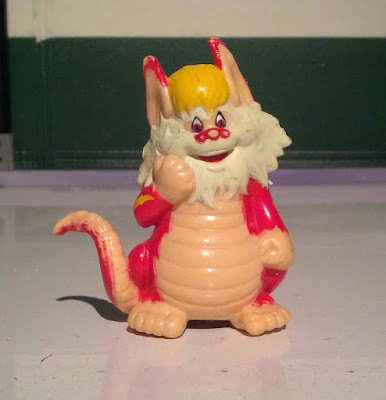 By the time Snarf was included though, I already had a Lion-O figure and my Mom couldn't justify buying the same figure just to get this accessory. 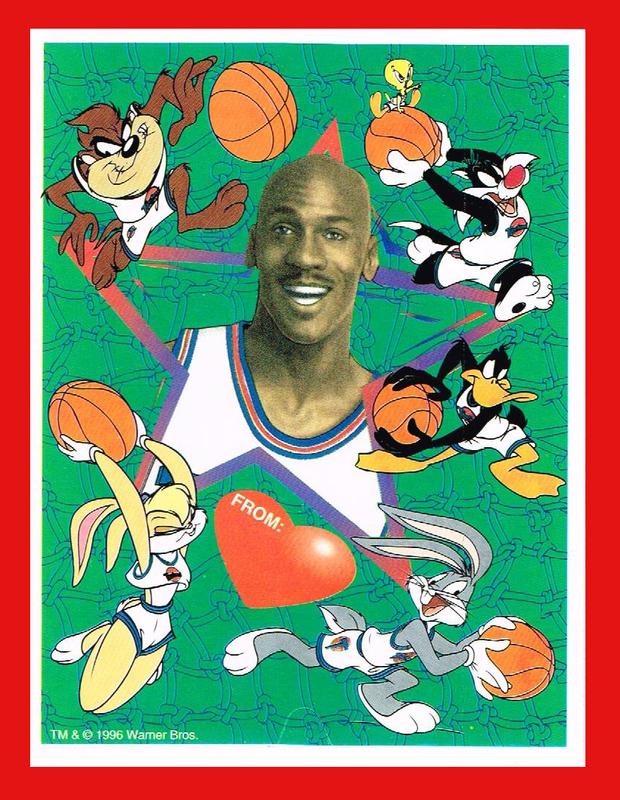 Damn LJN!!! I found this figure at a second hand store for about $1 and now I can finally add Snarf to my Thundercats collection! 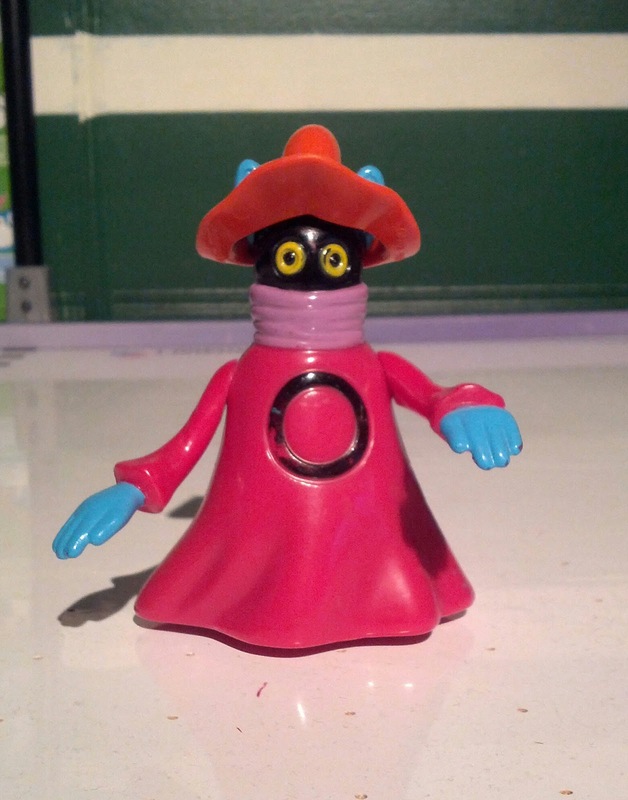 Check out some of my other Fave figures by clicking HERE! Bonus Fun Fact: This song won the 1995 Grammy award for Best Rap Solo Performance! This video features a cameo appearance by some more famous New Jersey MCs, Naughty By Nature. 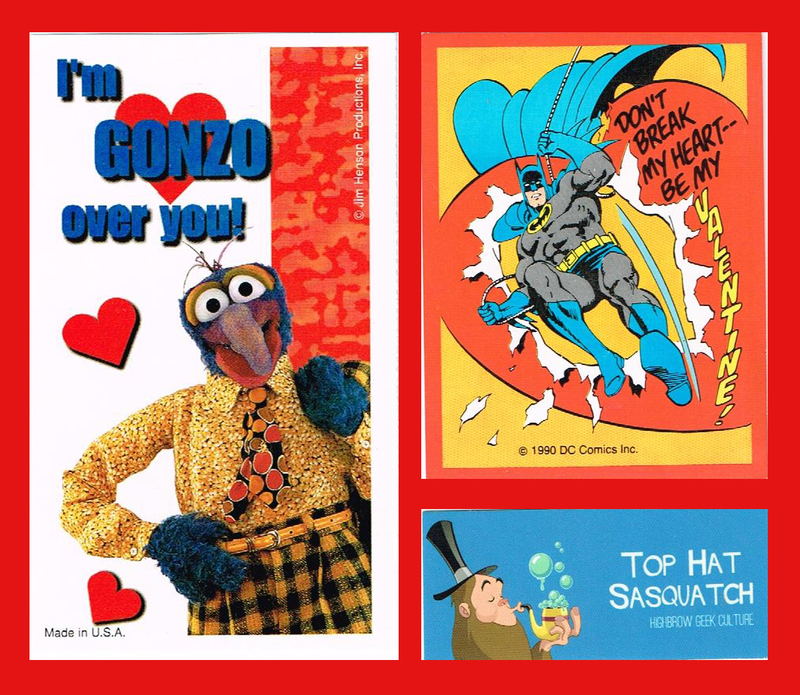 It's been crazy cold all over the United States these last few weeks, so hopefully taking a look at these retro Valentines Cards from the 80s & 90s will help to spark some warm memories of years past. 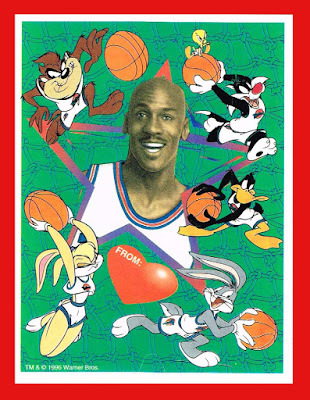 When you handed out cards of your favorite cartoon characters to your friends, teachers and special someone. I love seeing the faces of my kids as they fill out their cards for their classmates. 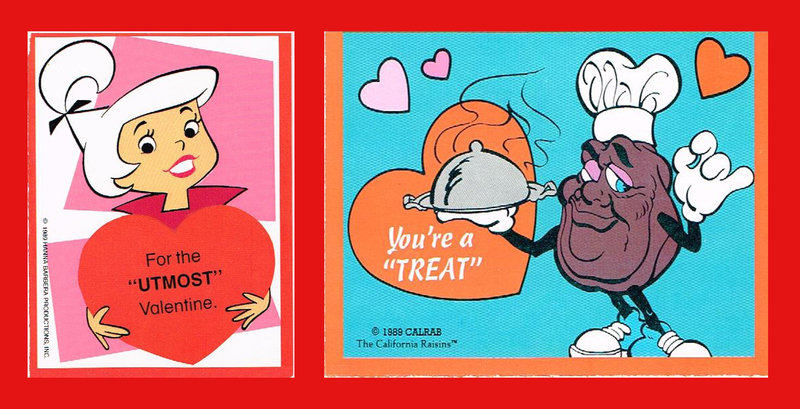 It brings me great joy to know the tradition of handing out Valentines still gives kids joy today. A few years ago the fine people at the website Top Hat Sasquatch wanted to bring back that fun to it's readers and wouldn't you know it, I was one of the lucky ones to receive some Valentines! 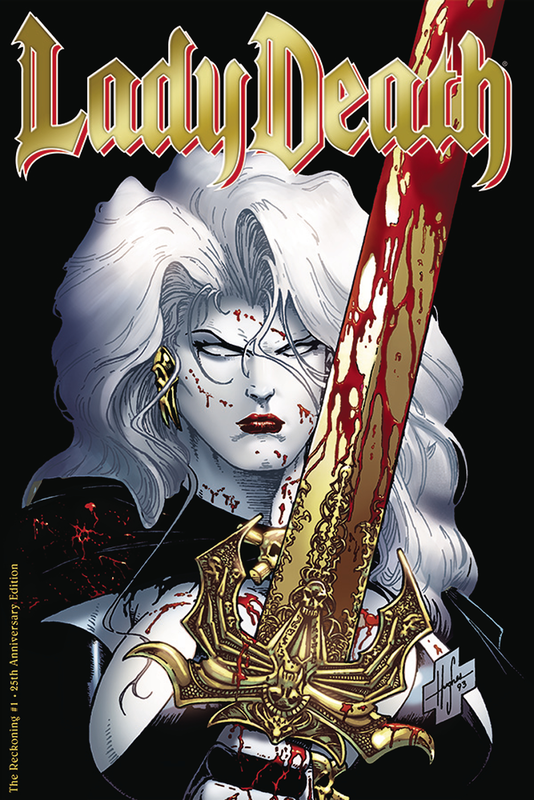 They sent a great selection and now I am sharing them with you. ENJOY and HAPPY VALENTINES DAY! You can check out all the fun at Top Hat Sasquatch by clicking HERE! Bonus Fun Fact: The original composer of the song "Play That Funky Music", Rob Parissi never gave permission for Vanilla Ice to sample his music and won a $500,000 copyright infringement lawsuit! I loved seeing these photos of Homer and Marge from before they had children. It really gives you a glimpse into the people they would become and how they got there. I may be getting too deep with this one, but it's always cool to see what your parents were like before you born. It gives you a deeper appreciation for them as people. 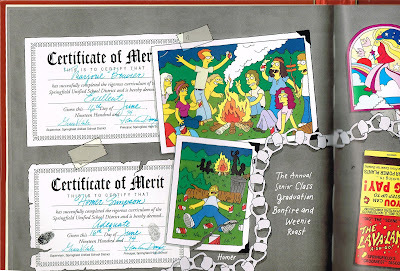 Plus it's pretty surprising to see Homer's High School Certificate of Merit. Here is where it all began. This was the start of the Simpsons clan. Baby Bart has finally arrived. I wonder if he got his name from the package shown on this page. Who would include that in a family scrapbook? I included this page because of the El Barto Wanted poster. I always thought Bart was cool and strived to be an underachiever (and be proud of it). 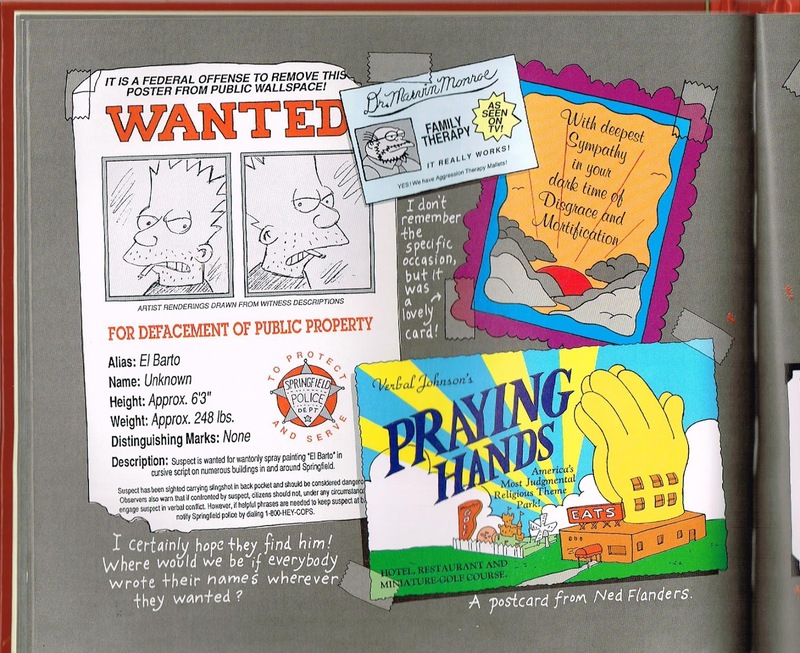 I gotta give Chief Wiggum some credit, he was pretty close with this sketch though. 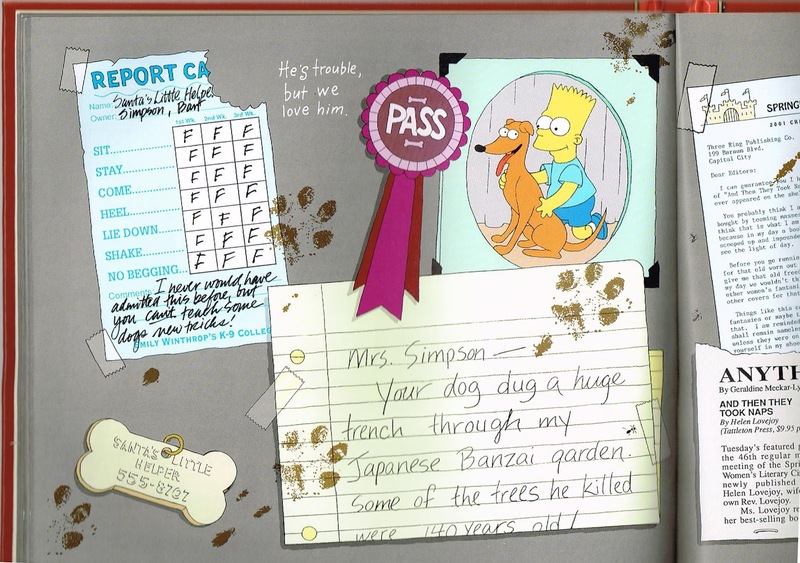 "Bart's Dog Gets an F" was an early episode highlight for the Simpsons. It finally put the spotlight on Santa's Little Helper and the results were amazing. 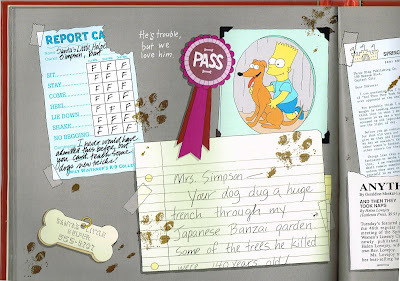 Who can forget when the family dog destroys Homer's new $125 pair of Assassins sneakers. 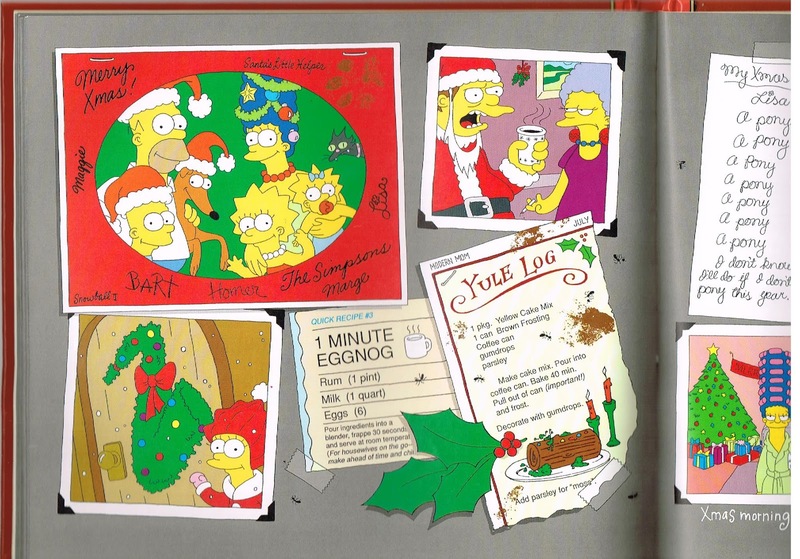 Great scene, great episode & cool page in the Simpsons family album. 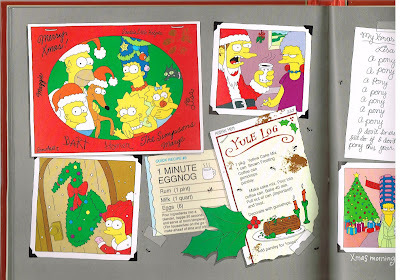 I just added this page because it reminds me of the day I first watched the Simpsons Christmas special when it aired on FOX 5 on December 17th, 1989. 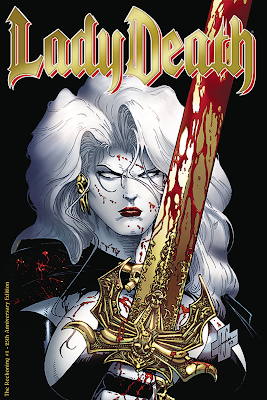 I watched it when it very first aired and I have been a fan of the show ever since. 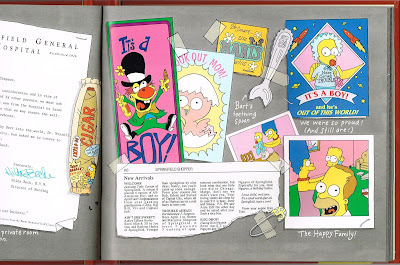 This Simpsons Family Tree was especially interesting to me. If you follow the lines to the left you will see that Homer is actually related to Mr. Burns in some crazy way! Interesting stuff. 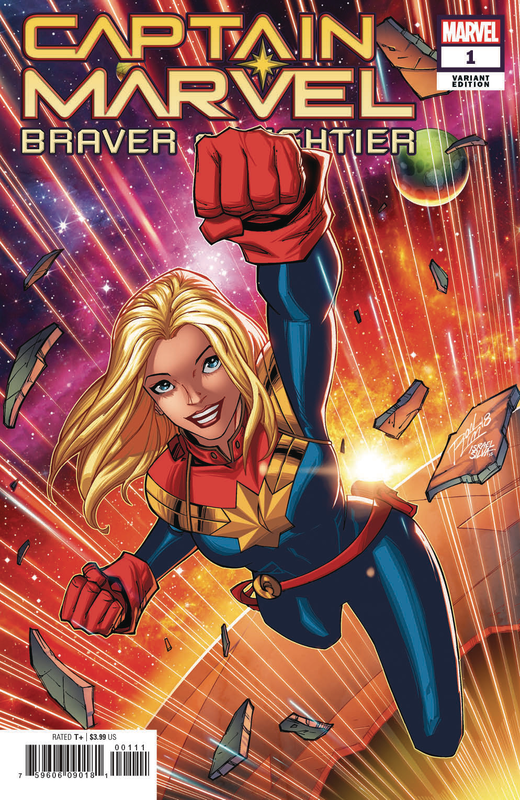 I wonder if this book is cannon to the series? 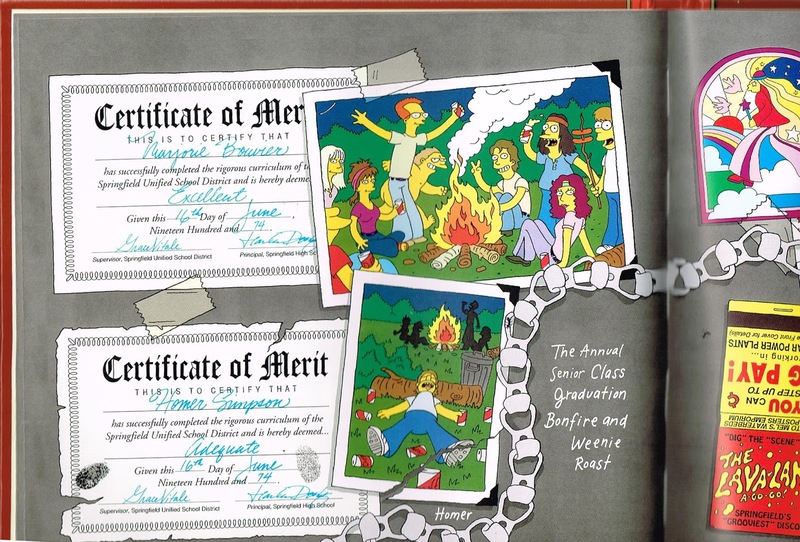 What a cool way to end this entertaining trip through the first few decades of the Simpsons Family History. 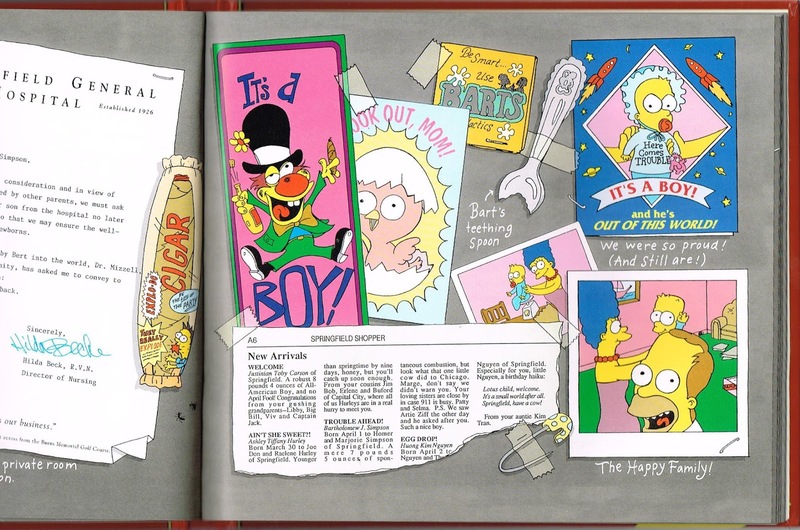 Now enjoy where it all began with the first Simpsons short that aired on The Tracey Ullman show on April 19th, 1987.